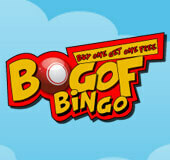 Bogof Bingo |Claim a £30 FREE bonus TODAY! Love extra value at the reels? Then roll over to Bogof Bingo, the ultimate mega-value Buy One Get One Free Bingo site, which has recently had a revamp for 2015. Branded with lashings of luscious green scenery, this idyllic, cartoon-style bingo site is powered by the Alderney label, the same powerhouse behind Scarlet Bingo. When you first roll up to the site, you can soak up the scenic delights while Bogof rolls out the welcome mat to greet you with a generous Welcome package. You can also cruise through a luscious collection of top online bingo, FREE bingo, slots, casino, instant, and progressive jackpot games. The fun never stops at Bogof, so the reels are also overflowing with daily FREE offers, bonus treats, FREE spins and rolling jackpots waiting to explode. You can also head over to the Facebook page for more exclusive offers and jackpot wins! Bogof Bingo rolls out the red-carpet treatment for its players, so you can expect an unstoppable selection of promotions, bonus treats, freebies and plenty of chances to win life-changing, jackpot-blasting prizes. When you first deal yourself into the site, you can by collect more at the reels and kick-start your Bogof experience with an extra value Welcome Package. 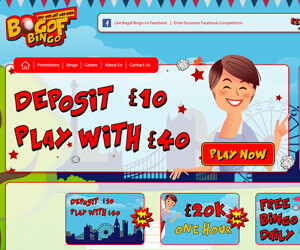 All you have to do is deposit and stake £10 on Bingo tickets, and you'll be spoilt by an awesome FREE £30 Bingo bonus. This means you'll have a super cool £40 to start your scenic adventure with. You can then expect to be bombarded with a luscious collection of offers. First up you can head down to the Free Room every day at selected times to get in on the action and play daily SUPER free bingo, and play mega value Buy One Get One Free Bingo at selected times as well. Next up you can get the party started on the first Saturday of each month and hit the Big Money Room to play £1k games and grab a hot slice of the £20K Bingo Win Jackpot. You can also high-roll your way through progressive jackpot hits like the Clover Rollover game to reach dizzy heights and even the £3 million mark. You can also get ready for plenty of bonus action, juicy freebies, Free spins, tasty jackpots and mouthwatering chances to avalanche your way to big winnings! The fun never stops at Bogof Bingo, as it fires up the entertainment stakes with a fun-packed collection of la creme de la creme of gaming hits. First up, you can coast through a juicy collection of red-hot online 75 Ball, 80 Ball, 90 Ball bingo, FREE and Buy One Get One Free Bingo. Then you can hit the slots and instant games like the popular Clover Slot to rack up rolling jackpot riches. Next up you can ride through games like Britain’s Got Talent, X Factor, Dynamite Digger and Bouncy Balls and Judges Jackpot, which are sure to keep you locked at the reels for hours of pulse-racing entertainment. If all that's not enough, then you can take your seat at the casino table to give games like Roulette, Blackjack, Mafia Millions casino a whirl. Next you can thigh-roll your way through other tasty progressive jackpot games, to rack up life-changing cash rewards. If you love the social element of bingo, you can take the scenic adventure to the next level by hitting the chat room and the Facebook site to rack up even more mega value prizes, bonus treats and jackpot riches!